George Leigh Mallory and his climbing partner Andrew Irvine disappeared on the North-East Ridge of Mount Everest in early June 1924. A couple of days later, another Englishman, Lord Percival Bromley – not officially part of Mallory’s expedition – disappeared from the same location along with a German climber. Richard Deacon Davis, "the Deacon" to those who know him, is on the summit of the Matterhorn when he hears the news. A friend of the Bromley family, the Deacon accompanied Mallory’s previous two expeditions to Everest. With the financial backing of the Bromley family, Deacon and his friends, French Chamonix Guide, Jean-Claude Clairoux, and the American Jacob Perry, stage a secret expedition to the mountain in 1925, ostensibly to find the body of Percival Bromley and return it to England, but also to attempt an alpine-style assault on the mountain. When their lower camps are attacked by what appears to be the mythical yeti, the Deacon and his team find themselves trapped on the mountain, the high altitude taking its toll the longer they remain above 26,000 feet. Facing an unknown but deadly enemy below and almost certain death above, the Deacon and his friends find themselves in a race against time that will not only ensure their survival, but determine the future face of Europe. Back in 2007, Dan Simmons wrote The Terror, the massive fictional account of Sir John Franklin’s final fatal voyage in search of the Northwest Passage (inspiring my own visit to a local monument dedicated to Franklin’s second-in-command, Francis Rawdon Moira Crozier). Simmons took the facts of the story and interwove a narrative that included a number of supernatural elements which, nonetheless, provided a plausible explanation of the fate of the crews of the HMS Terror and Erebus, while still hitting every single factual element of the tale (why, for example, there are graves on Beechey Island, or how the lifeboat that was found on the western shore of King William Island came to rest there). With his latest novel, The Abominable, Simmons takes a similar approach, shining his light now on the 1924 Mallory-led expedition to Everest. Rather than following the main expedition, Simmons mounts a fictional 1925 expedition and shows us the rigours of the northern regions of Everest without being tied to the absolutes of history (although, as with The Terror, what the Deacon and his friends find on the mountain tallies up with the current known facts about that fateful expedition). What Simmons doesn’t do – thankfully – is answer the question of whether Mallory and Irvine made it to the summit of Everest before they died. Simmons frames the story as the literary equivalent of the "found footage" genre, opening the novel with an introduction that describes his meeting with Jacob "Jake" Perry in his home state of Colorado in 1993. His purpose for visiting, he claims, is to interview the man about his experiences in Antarctica and he fails to pick up on the old man’s veiled hints about earlier, more dangerous, adventures. The bulk of the story is told in first person by Mr Perry who, having spent his final months on Earth writing his story down, sends the dozen notebooks to Simmons to do with what he will. 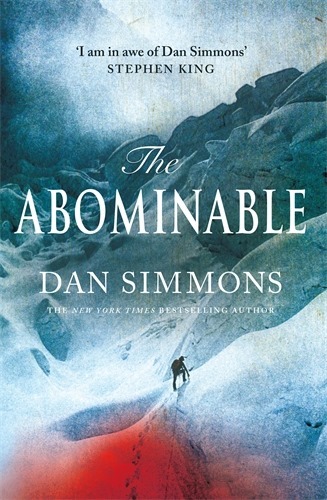 It’s testament to Simmons’ skill as a writer, to his ability to absorb knowledge about a certain subject – in this case mountaineering – and present it to the reader in the offhand manner that an expert might, that it’s difficult to tell, for at least the first part of Jake Perry’s story, whether this is, indeed, fiction. The central characters – the Deacon, stiff-upper-lipped Great War veteran, French alpine expert Jean-Claude and the always-feeling-out-of-his-depth Perry – are beautifully-wrought, vividly individual and engaging enough to immediately take up permanent residence in the mind of the reader. Irving clamps his mouth shut again, but the effect is ruined somewhat by the chattering of his teeth. In this cold, teeth can shatter after two or three hours — actually explode — sending shrapnel of bone and enamel flying inside the cavern of one’s clenched jaws. Sometimes, Crozier knows from experience, you can hear the enamel cracking just before the teeth explode. On the mountain, we find an entirely new species of cold, but one that is no less dangerous. The high altitude, thin air and direct sunlight, all conspire to leave the climber sunburnt, despite the sub-zero temperatures in which they find themselves. We’re also given a taste of the local political situation, the relationships between Tibet and the rest of the world, Nepal and the rest of the world, and Simmons even takes time to give us a quick look at the changing face of European politics following Hitler’s failed Beer Hall Pustch at the end of 1923. The combination of title and author, with the brief description of the book’s subject, will ensure the reader enters this novel with a certain set of expectations. Unsurprisingly for a Dan Simmons novel, these preconceptions work well for the author, while the multi-layered narrative ensures that what the reader experiences may not be exactly what they signed up for. Everest is still 40 miles away but already it dominates not only the skyline of white-shrouded Himalayan high peaks but the sky itself. I suspect that the Deacon has brought a British flag to plant at the summit, but I see now that the mountain already bears its own pennant – a mist of white cloud and spindrift roiling in the west-to-east wind for 20 miles or more, from right to left, a white plume swirling above all the lesser summits to the east of Everest’s snow massif.